Of course then came the sampling. First up? The Pumpkin 31 Spiced Lager. It's a dark amber color and, well, delicious. The next choice? 62 Imperial Pumpkin Ale. Are you noticing a trend? A slight fall/pumpkin obsession? Take it back! This is a NO JUDGEMENT ZONE. The verdict...also delicious. It was a hard choice. Top with fresh goat cheese and enjoy! In a large pot, melt the butter and make a roux. After the flour is well incorportated, add the chicken stock, beer and milk while fairly constantly stirring. I had the heat at about a medium and it was a slow simmer. Next, add the cheddar one cup at a time, while whisking until smooth between each addition. Add the Worcestershire, pepper and lemon juice. add your steamed broccoli. I then pureed the soup using my handy dandy immersion blender. Simmer, stirring occasionally for about 10-15 minutes. Chuck a dollop of goat cheese on each bowl and ENJOY! We sure did. 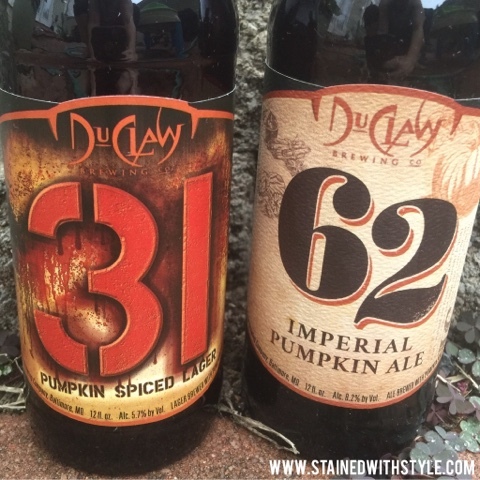 And go getcha some of this delicious Duclaw beer folks, before they run out.